This weeks project is an album for Dad. 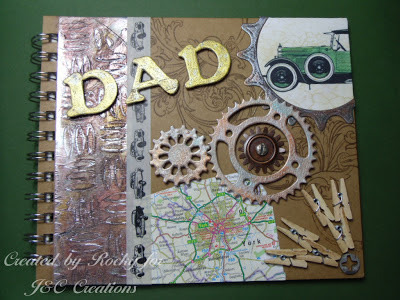 It started life as a plain brown ring bound album, it has several pages that can be used for photographs or as a note book. I began by using some wide metal tape along the hinged edge. This has been embossed with a mask that gives a checker plate look, it's then been aged with a mixture of acrylic paint and gilding waxes. I have torn a small piece from an old road map (don't use Dad's new one!) and aged it with Distress Ink Antique Linen. Once this was stuck on I have put a strip of masking tape along the edge of the metal, this one has cars printed on it but there are many to choose from. 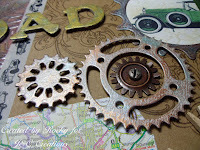 Next I stamped a swirl in Archival Ink Coffee then made some shapes with mini pegs that could look a little like a cog. They are stuck on with silicon glue as I found this held them a little better than PVA. The small screw head is a die cut shape from Tando coloured silver and aged a little. Next came the car picture which was a Friday Freebie on this blog a few weeks ago, perfect for this project. It's coloured in with watercolour pencils, aged with Distress Ink and stamped with a crackle stamp. The frame for this picture is a Spellbinder die cut cog from the Sprocket set cut in grey board, it has been coloured and aged with Cosmic Shimmer Gilding Waxes, then cut to fit the corner. The other two shiny cogs are from the same set, coloured in the same way and mounted on foam pads, but the metal cog with the screw top brad is from a set in the Vintage range. The letters that spell Dad are die cut using a Sizzix alphabet and coloured again with the gilding wax, they are then mounted on foam pads. I think something like this would make a great Christmas gift, especially if you have some personal items you could use in the decoration like a photo of his favourite car or a map piece of where he lives. Most of the items used are available at J&C Creations, if you can't see them on the website please give them a call, they'll be happy to help.